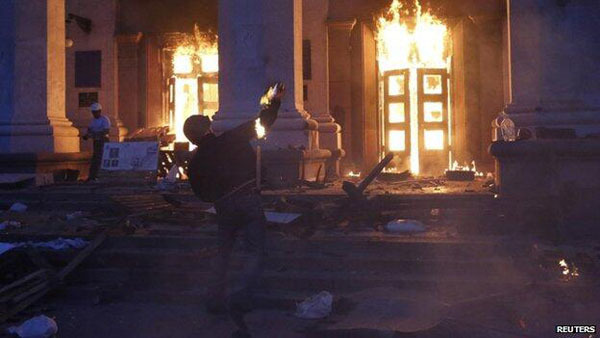 Most of the dead met a terrible end when a building occupied by Antimaidan activists was attacked by the pro-Ukrainian side and set on fire with molotov cocktails. Since then, there have been at least a dozen more deaths as the Ukrainian army has tried to regain control of the eastern city of Slovyansk, which had been held by Antimaidan forces. This is a horrific escalation of the conflict that looks ever more likely to rip Ukraine apart – the mirror image battle of reactionary forces on both sides, each backed by a rival reactionary imperialism. Ukraine is on the edge of civil war. Russia has been poised with 40,000 troops on the borders for weeks – a full scale invasion is increasingly likely. In response, US intervention is also likely to increase, ratcheting up the tension internationally. The latest grim events have borne out the analysis we presented here on Dream Deferred back in February, after the fall of former president Viktor Yanukovych and just before the installation of the new government in Kiev. We warned then of the danger of civil war. In fact, it is worth going back to this post in February to see where the this stage of Ukraine’s crisis began – and how it already had the potential to spiral out of control. We reported the beginnings of “Antimaidan” protests, opposed to the new pro-EU Kiev regime and oriented towards Russia – and how, mirroring the descent of Euromaidan into paramilitary organisation, the Antimaidan protestors in the south and east of Ukraine were already forming their own paramilitary groups. Just as Euromaidan was coloured by Ukrainian nationalism, the Antimaidan protestors bear Russian flags, regional flags or those of the former USSR. These two ugly nationalisms offer only greater division to Ukraine’s battered working class. And this climate has been a feeding ground for organised fascists, stoking racism, anti-Semitism and reaction – on both sides. Back in February, we pointed to the likelihood that Ukraine would lose Crimea – and the dangerous potential for a bloody break-up of the country. Now the death toll is rising, the Kiev government is reinstating conscription in order to raise forces to fight the pro-Russian paramilitaries in the south and east of the country. Parts of the Euromaidan paramilitary Samooborona, the so-called “Self Defence” organisation – with fascists at its core – have been incorporated into the new National Guard, effectively a politicised and partisan state force. 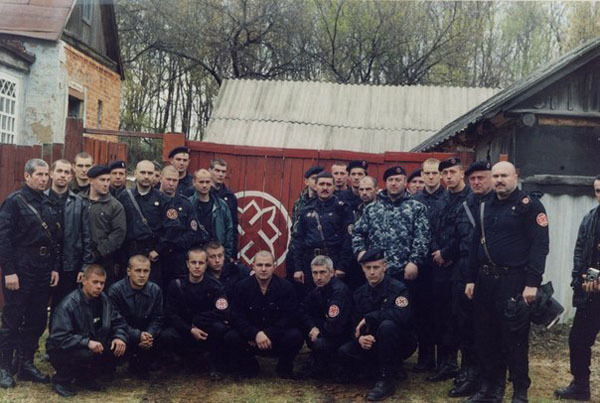 The independently led fascist fighters of Pravy Sektor (“Right Sector”) are also keen to throw themselves into the battle – in the interests of a Ukrainian “national revolution”. But no one should be tempted to back either side in a bloody conflict that can bring only division and devastation to ordinary people in Ukraine. There were some on the left who argued to support Euromaidan, seeing it as progressive or anticapitalist. We argued on Dream Deferred that as a movement Euromaidan was not progressive, despite the genuine desires of many protestors for greater democracy and a real anger at economic crisis. The pro-EU Euromaidan movement, which drew support mainly from then predominantly Ukrainian-speaking west and central regions, did not raise working class demands that could have reached out to workers in the south and east. Instead, it was wrapped in Ukrainian nationalism and the fascists’ role was unquestioned. And we exposed the prominent role of fascists both within the wider Euromaidan protests and especially in the development of its paramilitary forces. And we revealed the presence of fascist ministers in the new Kiev government, well ahead of the mainstream media. Now there are others on the left who see some kind of salvation in the Antimaidan movement, the broadly pro-Russian or “separatist” protestors – and their paramilitaries, who in imitation of the rival paramilitaries of Euromaidan have occupied government buildings and set up checkpoints. They have for weeks been engaged in a military confrontation with the Kiev government, which sent the army in against them. I would argue that people on the left should resist supporting either side in this grim battle. The eastern movement is no more progressive than its Euromaidan mirror image, despite the genuine fears and anger of many of its supporters, who do not believe the Kiev government is legitimate and who feel threatened by the Right Sector and other Euromaidan paramilitaries. But as with Euromaidan, the Antimaidan protests have not articulated working class demands – the sort of politics that could reach across the divide. Instead, Russian nationalism pervades Antimaidan – sometimes with a Stalinist shade. Russian and Soviet Union flags have been much in evidence and the movement’s unifying symbol is the black and orange striped Ribbon of St George – taken from the medal ribbon awarded by the Soviet Union in World War II. These hark back to the days of a greater Russian empire that incorporated Ukraine. The pro-Russia and Russian nationalist politics that dominate Antimaidan are a comfortable environment for fascist groups. In the more chaotic environment of Antimaidan, fascists are not the easily identifiable organised force that they were in Euromaidan – but they are there. Ukraine’s largest fascist organisations, Svoboda and the groups that make up Right Sector, are based on Ukrainian nationalism. But there are smaller Russian nationalism-based fascist groups in Ukraine as well, such as Slavic Unity, which is linked to the nazi Russian National Unity party inside Russia. Some of these Russian-oriented fascists staged a march in Donetsk, east Ukraine, in November last year – shortly before the outbreak of the Euromaidan protests. Now such groups are able to immerse themselves in Antimaidan. The black, gold and white monarchist flag, favoured by Russian extreme nationalist and fascist organisations, has been on display in some areas, along with slogans calling for a “New Russia” – incorporating south and east Ukraine – or a Greater Russia, taking in Ukraine and Belarus. And a readily noticeable strand of anti-Semitism infects Antimaidan propaganda, along with other racist and homophobic material. The Antimaidan movement likes to dub itself “anti-fascist”. But, as when Russia’s deeply reactionary president Vladimir Putin claims to be an “anti-fascist”, this should be seen as the hollow propaganda that it is. Genuine anti-fascist movements are not built by promoting rival nationalist or chauvinist ideas – nor by small groups of young men forming unaccountable armed paramilitary groups. This creates only a mirror image of the Svoboda and Right Sector forces. In a particularly twisted combination of fake “anti-fascist” rhetoric and real anti-Semitism, some graphics are designed to illustrate the perverse idea that the nazi Right Sector is a Jewish or Jewish-controlled organisation. Antimaidan lacks the well known political figures who assumed the leadership of Euromaidan – nor does it have a clear, unified set of demands or the central focus of Kiev’s Independence Square (the original “maidan”), although in some cities there have been sizeable Antimaidan demonstrations. In the eastern and southern provinces, a range of groups and militias has emerged, including the well publicised “People’s Republic of Donetsk” with its red, blue and black flag, along with the Donbass People’s Militia, the Eastern Front, the South-Eastern Army and others. These have thrown up leaders who are previously unknown – and not obviously elected. They are an unsavoury looking bunch. They include Denis Pushilin, the “governor” of the People’s Republic of Donetsk, a former pyramid scam operator. The Donbass People’s Militia is led by Pavel Gubarev – a former member of fascist paramilitary organisation, Russian National Unity and of the Progressive Socialist Party of Ukraine, which despite its name is allied with the Eurasian Youth Union linked to influential Russian fascist Aleksandr Dugin. The “mayor” of Slovyansk is Vyacheslav Ponomaryov, a veteran of the Soviet Union’s war in Afghanistan and formerly the manager of a soap factory. He is reported to have called on supporters to report “suspicious people”, particularly Ukrainian-speakers to his militia. And unknown gunmen claiming to be acting on the orders of Ponomaryov attacked and robbed Roma families in their homes in April. We know that the pro-Ukrainian activists involved in the horrendous clashes in Odessa on 2 May, many of them from football “ultra” firms who used a football match as a pretext for a planned battle, included Right Sector fighters – the fascist organisation is mourning the death of one of them. 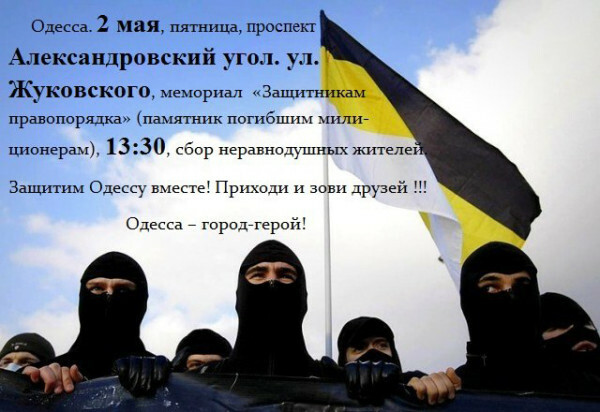 But an image distributed by the Odessa Antimaidan “Southern Front” group, urging “concerned residents” to mobilise on 2 May and “defend Odessa together”, portrays masked fighters with the black, gold and white flag used by Russian fascists. Importantly, this is not to say that all or even most of those who support or have been involved in the Antimaidan movement are fascists – of course most are in no way fascist. Among the Antimaidan activists who met such horrendous deaths on 2 May were an elected Odessa councillor from the mainstream Party of Regions and an activist from the small fringe leftist group Borotba, which has involved itself in Antimaidan. Most of the Antimaidan supporters – like most of Euromaidan’s supporters – are motivated by genuine anger at the collapsing economy and the corrupt political system. In addition, as an opinion poll carried out in the eight provinces of south and east Ukraine by the Kiev International Institute of Sociology(KIIS) in the second week of April found, only a third of people in these regions believe the new government is legitimate. This is not surprising: the Kiev government came to power in the wake of Euromaidan – a movement that won little support in the south and eastern regions of Ukraine, where the Russian-speaking population is concentrated and where cultural and economic ties to Russia are stronger. But it is worth noting that just 12% of those polled supported the paramilitaries’ seizure of key buildings. In fact the two main worries expressed in the survey were “rampant banditry” (43%) and the collapse of the economy (39%). These were followed by the threat of civil war (32%) and non-payment of salary and pensions (25%). It seems likely that these fears are shared by people in the west and central regions too. Strikingly, the poll also revealed a real desire to tackle the tiny oligarchy that controls Ukraine’s economy – and most of its politicians. It found that nationalising the property of the oligarchs was supported by 24% with another 41% backing the nationalisation of property they had “gained illegally”. But neither Euromaidan, nor the pro-Russian movement in the east has raised the sort of politics and demands that could unite workers across Ukraine. They remain entrenched in the traditional political divide – formerly expressed in voting for parties aligned with the two wings of Ukraine’s oligarchy: one whose interests lie with the EU and the other whose interests are closely tied to Russia. Now this dead-end politics has been militarised. And this has a dynamic of its own – one that is spiralling out of control as the formal state structures implode helplessly. Although the mass Euromaidan movement dispersed after the fall of Yanukovych, the paramilitary Self Defence and Right Sector forces did not demobilise. In several cities they have been carrying out “patrols” – with and without local police – as well as staging robberies, carrying out beatings, raids and racist attacks and attacking politicians and state officials. A human rights group, the Information Group on Crimes Against the Person, has collated a list of those incidents that appeared in local newspapers. It also notes a so-far smaller number of violent offences carried out by the Antimaidan side. In western and eastern Ukraine in turn, government buildings and police stations have readily been captured by whichever group lays siege to them. The Kiev government admits it cannot control the situation in the east. Outside Ukraine, the wolves are at the door. The major imperial blocs – Russia on one side and the US and EU on the other – are playing out their rivalry in Ukraine, long a bloody battleground for rival imperialisms. Neither Washington nor Moscow has anything positive to offer people in Ukraine. Both sides are interested only in carving up the world in the interests of their own capitalist blocs and at the expense of ordinary people. Ukraine is of much greater strategic and economic importance to Russia. So Russia is ready for large-scale military intervention. It has some 40,000 troops mustered on the border and prepared to invade at any time, threatening a devastating and bloody war. The US/EU side is concerned primarily with blocking Russia’s expansion – its own imperial “backyard” lies elsewhere. The US and EU intervention in Ukraine, corresponding to its level of interest in Ukraine, has so far been softer, with sanctions rather than tanks the main instrument – although this could change as the crisis escalates, especially if Russia moves in. Socialists in the NATO countries should be ready to protest at any sign of the US or EU moving towards direct military action. The US and EU provided high-level and very public support for the Euromaidan politicians, well ahead of the fall of Yanukovych. Here we see the Euromaidan leaders, including Svoboda fascist Oleh Tyahnibok, with EU officials and senior US representatives. And the Western powers were swift to recognise the new government – regardless of the fact that it is regarded as illegitimate by many people in Ukraine. The new government’s accession to power was marked immediately by a $27bn IMF loan – complete with an austerity package which, Kiev announced, includes a 50% hike in domestic gas prices from 1 May. Ukraine’s workers are set to pay the price. The US is involved in military activity too. CIA chief John Brennan made a very public visit to Kiev in April – although in the Western media this passed without adverse comment. US paratroops are on manoeuvres in Poland and the US is supplying supposedly “non-lethal” assistance to the Ukrainian army. No one should be taken in by the hypocrisy of the US and European leaders who think it’s fine for them to wage war in Iraq, yet oppose invasion by Russia. But nor should we fall into the trap of excusing Russian intervention – in this system of rivalry, there is no good imperialism. As the death toll from fighting inside Ukraine mounts, with each side receiving the backing of the rival imperialist powers, the propaganda war will step up. But there is no good side to choose. Neither set of reactionary paramilitary groups – nor their rival imperialist backers in Washington or Moscow – offers anything other than division and the threat of further bloodshed. Ordinary working class people across Ukraine will pay a heavy price if the country is torn apart. This article has been very helpful, particularly with its information about the Russian fascist background of the leaders in the the Antimaiden movement. Unfortunately, this has not been well covered by the many other Left sources I read. Even the Anarchist groups, both Russian & Ukrainian, haven’t provided information as specific. I must admit that, in following the events as they unfold I may have lost some critical perspective, too easily taking in the reports of the more or less “official” anti-fascists, who’ve been quite forthright in reporting about Svaboda & the Right Sector, but very silent about the leadership of the resistance. I have no doubt that the Ukraine is a powder keg & that the fuse is already lit. No matter which side prevails, the working class stands to lose. Can a real revolutionary sensibility arise out of this mess, or has the Soviet legacy poisoned the well?